International Journal of Chemical and Process Engineering Research (IJCPER) is published by “Conscientia Beam”. It is a peer-reviewed journal which publishes original research papers. It focuses the broad fields of chemical and process engineering. The objective of this journal is to bring together study fellows and experts from industry to teach the latest topics of importance and build long lasting group effort. The journal welcomes papers in which knowledge from other disciplines is integrated with chemical engineering are especially welcomed from the scholars all over the world. It is currently published on monthly basis. Peer Review and Decision of Reviewer: The IJCPER is following double-blind system for peer-review; both reviewers and authors’ identities remain anonymous. The paper will be peer-reviewed by three experts; two reviewers from outside and one editor from the journal typically involve in reviewing a submission. The review process may take 3-5 weeks. The result of review will be sent to the corresponding author by email, and he/she will be assumed to send other authors. DOIs at the Article Level: Each paper published in International Journal of Chemical and Process Engineering Research is assigned a DOI number, Click HERE to know what is DOI (Digital Object Identifier). CB Publication Ethics Statement: International Journal of Chemical and Process Engineering Research is following the Publication Ethics guideline of Committee on Publication Ethics (COPE). Please read the Publication Ethics and Malpractice Statement of IJCPER. 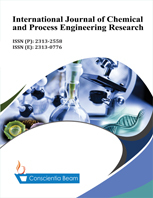 Journal Membership: International Journal of Chemical and Process Engineering Research is a member of Cross ref.